The Ministry of Finance (MoF) has sent out a circular to government ministries, Dzongkhags and all government agencies to come up with proposals on saving costs, as part of a new austerity drive. The move is inspired by the ‘Financial Thrift’ report compiled by the officials of the MoF under the Interim Government. The ‘Financial Thrift’ report outlines several areas where cost can be cut and these are; hospitality and entertainment, TA/DA, computers and stationery, office buildings, ex-country trainings, central schools expenditure and maintenance, among other areas. The Finance Minister said that the exercise would aim to save cost and prevent irrational use of government resources. The minister said that the austerity measures would be guided by guidelines that the MoF is currently working on, along with other government agencies. The guidelines will have two parts. The first will focus on hospitality and entertainment especially for ministers and senior government functionaries (see separate story on page 1). However, the main cost cutting for all government ministries and agencies will come in the second part of the report. This part of the report will look at cost cutting in areas like TA/DA, maintenance costs and other areas mentioned above. 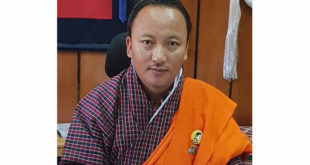 Lyonpo said one aspect that is being looked at is the how government agencies rush to spend unspent money at the last minute, which compromises the quality of works. This part of the report will also come up with standardized guidelines on internet packages, computers and stationery among other things. Lyonpo said that currently some agencies have different internet packages from broadband to lease lines, and this results in costs. He said the situation was the same in computers and stationery items. The minister said that uniform guidelines and standardized cost would save money. 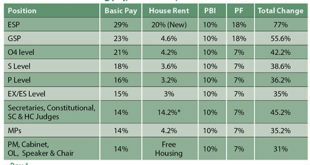 One aspect of the thrift report was on the large number of government office constructions. 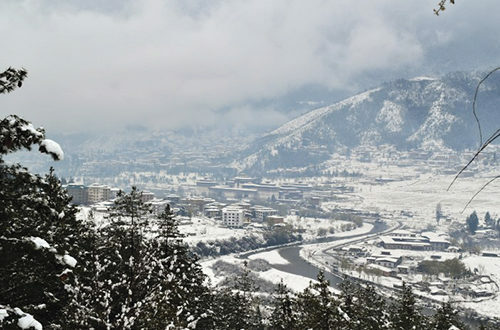 Here, the current government has already taken action by freezing all government office construction within Thimphu, to both rationalize the space use and also see if some offices can move out of Thimphu. 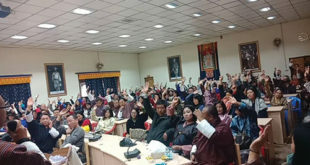 Lyonpo, giving an example of cost saving measures, said that government offices are now being encouraged to go for e-procurement which is essentially floating procurement notifications online, instead of in the media. The finance minister said that the guidelines would be framed based on a consultative basis and all ministries, dzongkhags and agencies would be consulted. The target set for the guidelines is by the end of this fiscal year, which is June 2019, so that it can be implemented in earnest from the 2019-20 financial year. The exercise will also look at ex-country trainings among the civil service. When the minister was asked about any chilling impact on segments of the private sector by such an austerity move, the minister said that even the relevant private sector companies would be consulted when it came to the procurement process. This is not the first austerity measure of its kind but one in a long series of austerity measures since the start of elected governments in 2008. The first major austerity move was recommended in the August 2008 First Pay Commission report where it came up with numerous recommendations to slash costs in TA/DA, medical treatment outside Bhutan, internet and telephone, electricity, rentals, vehicles, stationery, entertainment and hospitality, furniture, computers and streamlining procurement and construction. The savings were supposed to save money and raise resources for the then recommended pay hike, which got divided into two hikes in 2009 and 2011. The second major set of austerity measures were seen after the rupee crisis in 2011-12 when government expenditure was strongly curtailed and restrictions were even put on bank loans and general imports. The third wave of austerity measures were announced after the 2013 elections when the PDP government decided to go in for additional cost cutting to bring down government expenditure and ensure no unnecessary works were carried out. One of the visible measures was not allowing new government offices and even the BCCI office to come up. There have been smaller austerity moves in between, like the 2014 Pay Commission report that recommended cost cutting measures; including efforts with each annual budget to cut costs. However, all of the above austerity measures have failed to control ballooning government expenditure, especially on the current expenditure side. In the 2018-19 budget the current budget is a whopping Nu 29 bn which is almost three times the Nu 11.9 bn current expenditure budget in the 2008-09 annual budget 10 years ago. He said that austerity measures in Bhutan essentially aim at weeding out the small grass but ignore the giant and overgrown bushes. He said that cuts in small budget item heads make only a negligible impact and, in fact, can backfire if it is not done properly. The senior official said that one core issue is that the civil service is bloated with a huge numbers and this will automatically increase current expenditure. He said the other issue is that the procurement system which is under the MoF is not designed to either save costs or ensure efficiency and good quality works. He gave the example of having to procure air tickets at a much higher cost through a tender process even when much cheaper and better tickets are available in the market. The official pointed out the irony that the same ministry (MoF) in charge of the procurement rules and system is coming out with such a report. The official also pointed to the fact that instead of just focusing on small cuts, the more important thing is to do a thorough study on the cost effectiveness of the resources allocated and used, as well as a cost benefit analysis. “The government is not a uniform agency but has several different types of organizations with different roles and functions and needs. Efforts should be made to see the actual outcomes as some agencies may actually require more resources,” he said. He pointed out that a standard decision to cut expenditure across the board could even harm agencies. He gave the example of the harm that can be caused by cutting the entertainment and hospitality budget of the Ministry of Foreign Affairs which has to keep hosting important foreign dignitaries, both here and abroad. The official said that the austerity reports are typical of the bureaucratic thinking within the MoF and the government system that ignores the larger picture. He said the Royal Address also talks about ensuring efficiency and effectiveness in utilizing scarce resources. “The address also talked about how public servants will fail if they don’t learn from and correct past mistakes, are unreceptive to feedback, have no accountability, are not responsive to new ideas and solutions and have poor communication and coordination,” said the official. He said that the issue is not just about finances but also on if civil servants are working, their level of productivity and what happens to efficiency if one third of the people in the system are not working. The official said that instead of just looking at small cuts, the government must look at cores issues like the size of the civil service and their relative efficiency, the cost efficiency and cost benefit analysis of resources allocated, procurement reforms, results against resources and manpower and also non financial areas of governance which ultimately affect not only the finances but also the quality of government services and projects.